"I have recently been reading Lars Schandorff's Playing 1.d4 books, thinking that it cannot possibly get more instructive than this. To train with good trainers is all very good, but if you want to become great, you have to read books. A great salute to Schandorff and Quality Chess!" "I find this book to be amazing. The repertoire is ambitious, and, yes, there is plenty to remember and you will have to work hard to get through this volume. However, Schandorff has done most of the work for you by selecting the lines, handing you the key alternatives, analyzing everything, and providing you with countless new ideas in every single variation. Nothing worthwhile ever comes easy, and working your way through this book will be worthwhile! The result of your efforts will be to have an armory of weapons in all the lines of the Queen's Gambit, and you will become a stronger chess player. It may even hand you some easy wins along the way." "I liked very much Schandorff's twin works, as they offer a pragmatic repertoire for a wide range of strengths. If you are tempted by 1.d4, but are lacking in ideas, then with this pair of books '...you just might find, you get what you need'." 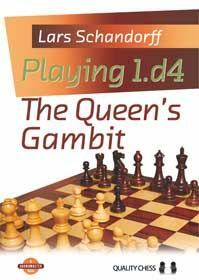 "Everything in Playing 1.d4: The Queen’s Gambit is covered in wonderful depth, it offers up many new ideas, and also features Schandorff’s playful (often sharp) humor." "Probably the best books and the strongest repertoire for White based on 1.d4 since Avrukh’s monumental two-volume work! The lines are strong, the analysis is so too. "A very valuable repertoire for the serious tournament player." "I found when trying out his repertoire that it was of an objectively high quality, but it was at least equally important that it was one which I could play! The ideas are clear, the quantity isn't out of hand and the lines typically make sense." "While 'Playing the Queen's Gambit' was successful, 'Playing 1 d4 - The Queen's Gambit' is even better. I can absolutely recommend it."